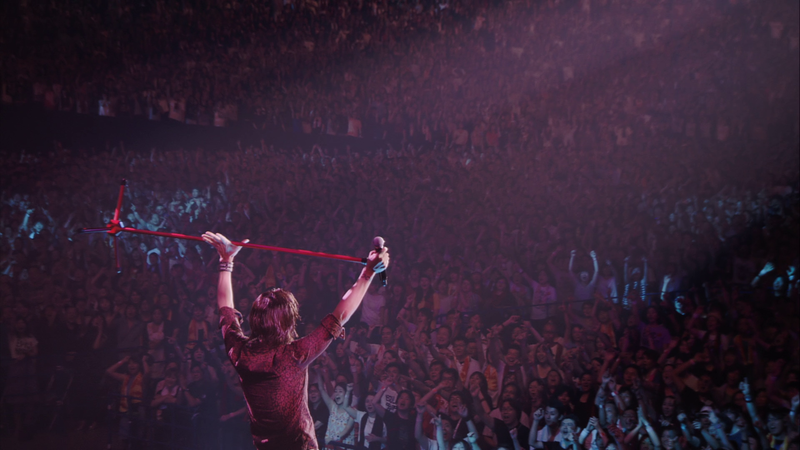 Over two years have passed since the home video release of B’z LIVE-GYM Pleasure 2013 ENDLESS SUMMER -XXV BEST-. 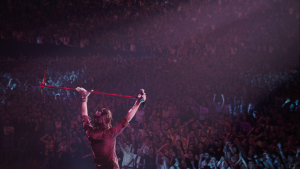 The band has had their share of singles, albums, and solo works in the interim, but it is with the recently-released B’z LIVE-GYM 2015 -EPIC NIGHT- that the band makes their big return to the live stage on DVD and Blu-ray. Today, we have for you an exhaustive review and report on the band’s latest release. Please be advised that this review is written to be mostly as spoiler-free as possible with regard to the specific surprises of the show, but the song inclusions and beat-by-beat moments are discussed at length. Additionally, translations and summaries of Koshi’s dialogue with the band and the audience are included for those seeking clarification. Read on to see exactly what awaits in the band’s latest home video offering and feel free to offer your own thoughts as well. The show begins with a shot of a red balloon as seen on the cover to EPIC DAY. The balloon traverses different parts of Japan, the world, the skies, and the ocean as a sentimental tune plays in the background. As the balloon ascends into the air, day turns to night and the tour’s logo is revealed on the other side. 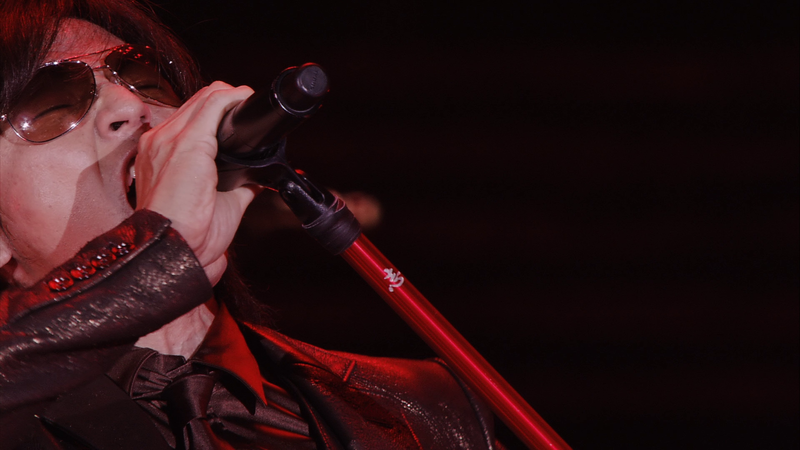 Koshi during the chorus to “RED” as it makes its anticipated live home video debut. RED ★★★★☆: A recording of the banjo opening to “RED” begins as Tak emerges in the center of the stage wielding a Les Paul. The tour-themed canvases are unraveled from the rafters as a spotlight reveals Koshi nearby. 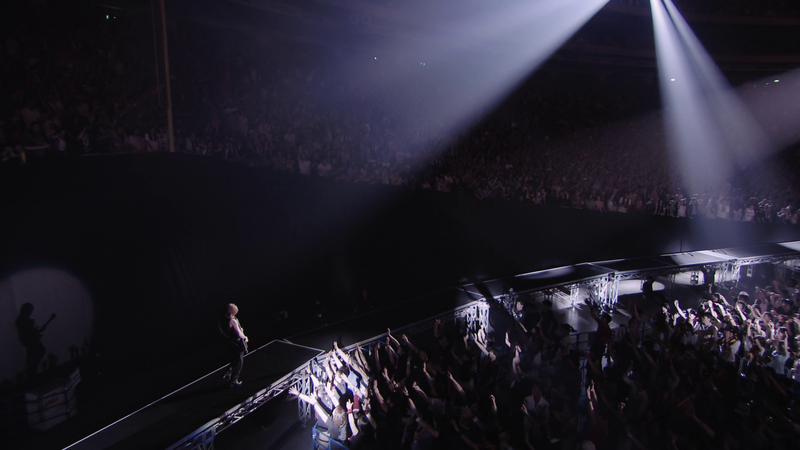 While album single “Uchouten” opened earlier dates on the tour, the well-received one-track single “RED” was given the opening spot in time for the dome showings, as seen here. In place of the flashy openings of years past, such as with “DIVE” in 2010’s “Ain’t No Magic”, “RED” is performed straight to set the mood for a hard rock affair that rarely lets up. 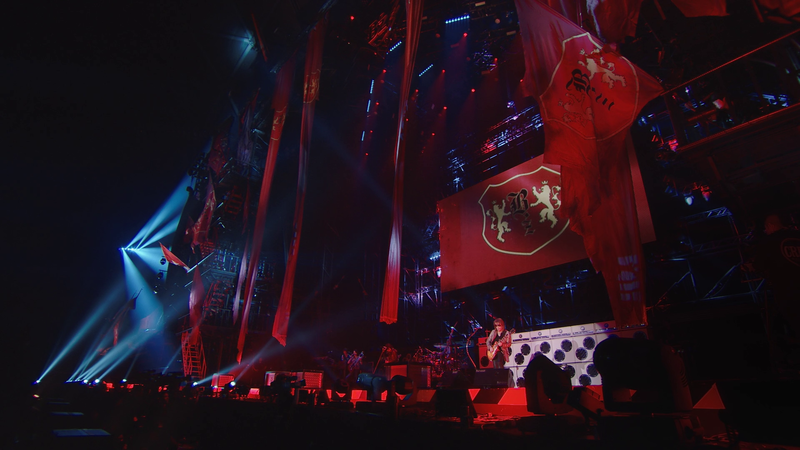 The trademark B’z energy and flair are all very apparent, with a stage design that is very much unlike anything the band has used in the past. NO EXCUSE ★★★★☆: The first album song from the show is the upbeat rocker “NO EXCUSE”. Some fun is had during the performance in the form of Koshi directly addressing members of the crowd in accordance with the song’s lyrics. The female audience member is displayed on the split-screen next to Koshi as he speaks directly into the camera. The band certainly get into the performance, and if this was a song that you liked on the album, there is no doubt you will relish it in this live rendition. 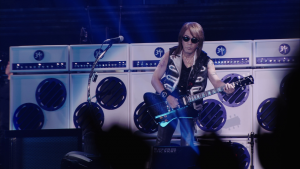 Tak performing with one of his many signature Double Cutaway guitars by Gibson. YOU & I ★★★★★: A long-time favorite of fans follows in the form of 1995 B-side “YOU & I”. The song may not have been performed live in sixteen years, but there is no evidence of such a drought here. The band acclimate to the song quickly, performing it with the same fervor and energy that you would expect from the usual staples that draws an especially warm response from the audience. The song is a lively fit for the stage, which hopefully will open the door for future LIVE-GYM appearances. TIME ★★★★★: Seminal fan-favorite “TIME” is the first ballad to appear in the setlist. The guitar work is especially on point during the song, with Tak relying on a Gibson Les Paul to provide the soulful melodic interludes needed to do the original composition justice. Both members of the duo roam the side skirts of the stage, as they commonly do during performances of the song. The two effortlessly perform the song as they have many times in the past, but something about the song’s compelling and euphonious nature always makes it seem like it could very well have been the first time. Koshi during “TIME”, a song that has long ranked near the top of the band’s ballads. HEAT ★★★★☆: “HEAT” sees its first mainline inclusion in a LIVE-GYM here much to the delight of fans new and old. 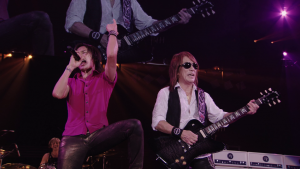 The song was originally composed by Tak and Koshi for use by Korean artist Kim Hyoon Jung’s Japanese endeavors, but it has undoubtedly become a trademark B’z song since their version was first recorded on 2012’s B’z The Best XXV 1999-2012. Tak and Ohga’s synergy on guitar especially shines during the song, giving it exactly the necessary sound. Amari ni mo ★★★★☆: One of the most interesting songs from EPIC DAY would be album song “Amari ni mo“, which comes next in the show. Tak finally breaks out his signature Trans Black Firebird guitar courtesy of Gibson and delivers a note-perfect performance. The bright, joyful, and exultant tune is suitable for the album’s theme, no doubt, but does little to solidify itself as a live song given its station of essentially being a ballad with a pop-rock wrapper. Ultimately, the performance is more a showcase of expert musicianship all around, with Takanobu Matsuda on keyboards providing a strong backing throughout. Tak performing with his latest signature instrument styled after the Gibson Firebird. Exit to the Sun ★★☆☆☆: Tak follows “Amari ni mo” with a soulful guitar solo backed by Ohga on an acoustic before transitioning to “Exit To The Sun“, which again benefits greatly from Masuda’s keyboard. Given the song does not have drums or bass for the first portion, when they are introduced midway, you do feel it. Nonetheless, while the meaningful and hopeful lyrics are delivered impeccably by Koshi only to be topped off by a perfect live rendering of the song’s melodic solo by Tak, the song itself is simply not a great fit for the live stage. On the whole, it feels much more at home on an album than it does in a live setting, despite the band performing the song with all due enthusiasm. Black Coffee ★★★★☆: The string of album songs continues with standout rocker “Black Coffee“. The song begins with a guitar-only intro that picks up on a dual-guitar riff. The verses are without a great deal of instrumentation, as with the album version, relying on Koshi to keep the song on point, which—true to form—proves a task he performs effortlessly. As the song reaches its high-tempo crescendo, the band delivers an appropriately rocking closing that transitions into another mic session for Koshi. The stage as it appears early in the show, which transforms several times throughout. For the second mic check, the band’s vocalist confers with the crowd, addressing different areas of the dome individually. He then thanks those in attendance for coming despite the heat outside and jokes he’ll play until he collapses given that he can finally sleep in tomorrow. The album, he continues, began recording in August of the previous year and it was not long into the sessions that the titles of “EPIC DAY” and “EPIC NIGHT” were decided upon. Koshi recounts the history of the tour thus far, noting the SHOWCASE in Shimonoseki that began the journey, and stating how thankful the band are able to happily and safely make it to the finale. Lastly, he notes that they released the album some months earlier and asks the crowd if they have listened to it. “We’ve played some songs off the new album now and the next song will also be from it,” he says, before adding, “It’s not a song that’ll get you very excited, but it’s instead one where you turn these encounters and connections into energy that allow you to move forward.” Koshi closes by noting that, with that in mind, he penned the lyrics to the song to follow. Kimi wo Ki ni Shinai Hi Nado ★★★☆☆: The first song heard by the public from what would make up the album, “Kimi wo Ki ni Shinai Hi Nado“, comes next. It was premiered all the way back in 2013 as part of B’z Special LIVE at EX THEATER ROPPONGI. Koshi’s vocal range is especially impressive here, as he hits notes that are not commonly utilized in the band’s more rock-oriented output. Counting from the wind-down that began with “Amari ni mo”, this makes for four slower songs in succession, but it soon ramps up and does not slow down a great deal for the remaining duration of the show. It bears noting that the song is well-performed and feels much more suited for a live performance than does “Exit To The Sun”, but certainly was never conceived as one for the stage. Koshi holding the mic up to the crowd to sing the chorus of “Man Of The Match”. Man Of The Match ★★★★★: An impressive laser show begins the next song with a bass, keyboard, and drums breakdown by the backing band before being joined by Tak. The psychedelic light show covers much of the arena as the extensive solo bridges into hard rocking album closer “Man Of The Match“. From here till the end of the show, the rock essentially never lets up. The wild and inspired performance is one that only B’z can deliver so fervently hot on the heels of a ballad. The crowd sing-along portions topped with Koshi belting out and carrying and stretching high notes throughout the song make the live performance better than the original CD version. 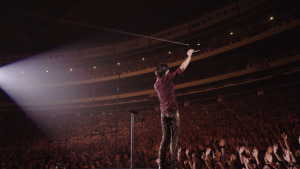 Koshi’s ending scream, especially, serves as an apt reminder that you are undoubtedly watching B’z at work. Koshi returns with another mic check session to briefly introduce the band members: Barry Sparks on bass, Shane Gaalaas on drums, Yoshinobu Ohga on backing guitar, Takanobu Masuda on keyboards, and of course Tak on guitar. Atsuki Kodou no Hate ★★★★★: Masuda begins the next song with an organ until Koshi surges in with a mellowed opening to “Atsuki Kodou no Hate“. The rapturous fan applause that follows is appropriate for the return of a beloved song last heard in 2002. The first portion of the song is played with a bluesy guitar basis from Tak while Ohga provides an acoustic backing akin to the original. Once the high energy middle section of the song begins, the stage crew begin assembling walkways for Koshi and Tak to tread into the crowd with. The song has been updated with a fresh new arrangement and is played in a heavier style than its original incarnation; in fact, the primary guitar riff has been energized and reworked, giving the song a bit more push. The walkways around the arena lead to two moving platforms that later join in the middle. During the tirp, the band enter a heavy jam session re-arranging the original song’s outro to give it all an entirely new freshness. As the two smaller stages converge on the other side of the arena, Tak and Koshi are left alone on the small stage that awaits them. Here, Koshi thanks the staff for getting them to the small stage and asks Tak how the view is from here, to which he responds it’s “beautiful”. After some amusing banter, Koshi asks the crowd to “please relax and enjoy” the next song. ZERO ★★★☆☆: Musically, this new arrangement of “ZERO” is a very rare departure for the beloved classic single. 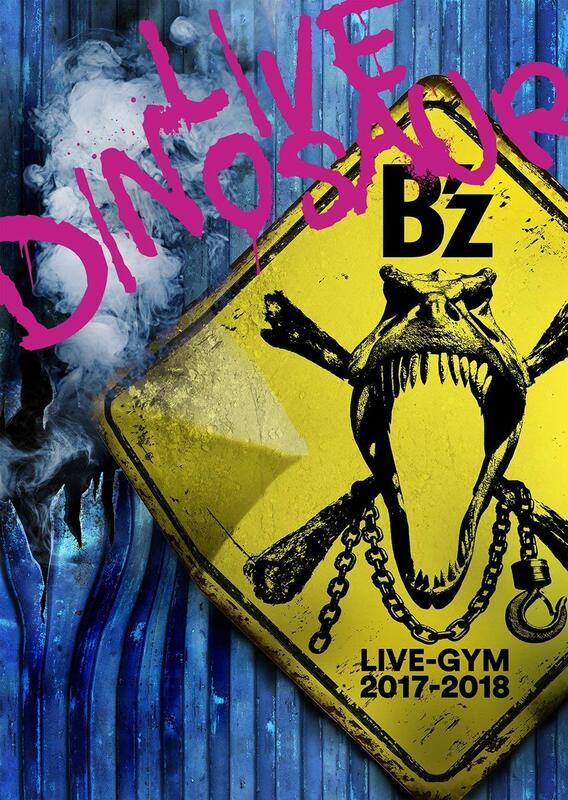 The song has been played similar to its original form since its live premiere during B’z LIVE-GYM Pleasure’92 “TIME”. The song essentially becomes a vocal showcase for Koshi, who delivers his part soundly with a harmonica solo included for good measure. Tak provides the instrumentation alone with just an electric guitar. This gritty interpretation of the song is certainly an interesting experiment, but some fans may come away wishing to have heard the original—or, possibly, at least have preferred it transition into the original halfway. Ultimately, while a curious diversion from the original, “ZERO” in this incarnation is likely to be relegated to this tour. Koshi playing acoustic guitar alongside the band during “Blue Sunshine”. 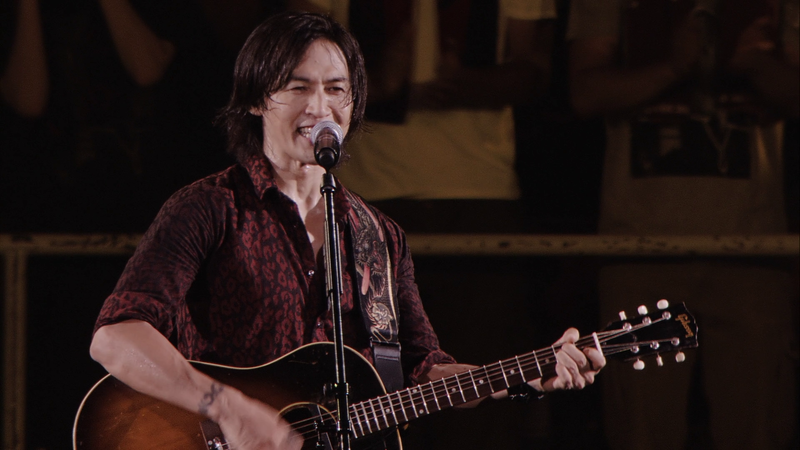 Koshi straps on an acoustic guitar as he waves and gestures in good humor to the supporting members who are still on the stage across the venue. He turns to the crowd to say, “Now, we’d like to perform something with the band—if you know the song, feel free to sing along,” and yells to Shane across the venue to count them in. Blue Sunshine ★★★★★: Fan-favorite “Blue Sunshine” begins as Tak provides an extremely bright guitar for this rendition that compliments the rest of the instruments exquisitely. Koshi strums along on acoustic guitar while providing pitch-perfect vocals throughout with improvised shouts here and there. For what is essentially a light power ballad, the performance is suitably uplifting and a stellar addition to the setlist. As “Blue Sunshine” ends, one of the best moments from the show begins to unfold as the drums, bass, and occasional backing guitar riff from the main stage start a four-minute build-up to the next song. A light show highlights Tak and Koshi as they begin making their way back to the main stage with Tak on his revolving platform and Koshi delaying by interacting with audience members in the vicinity. The walkway assembled mid-show to reach the revolving platforms that circled around the arena. The band’s jam session scores the moment as Koshi interacts with fans until finally climbing back to his platform to return to the walkway that had been assembled earlier in the night. He continues the mic session while adding a familiar “hi-hi-hi-hi” chant to the building backing instrumentation before culminating in asking, “What time is it?” as he playfully checks his wrist. After asking the crowd again, he asks, “Isn’t it time to be in ecstasy?” — a direct reference to the translation of the next song’s title. Uchouten ★★★★★: Masuda’s organ builds up to the intro of “Uchouten” as Tak takes over on guitar with the song’s indisputably beguiling riff. With its inherent crowd interactions, the song proves a perfect fit for a LIVE-GYM, allowing for a great energy throughout. It bears noting that the song was not as well-received in the opening spot earlier in the tour and for good reason: it was always destined to be in the last leg of a show as it is here. With the band now reassembled on the main stage, Koshi notes that as he traversed the path between stages, “I saw your smiles, your sweat, and that made me feel good—made me feel ‘EPIC’.” He reiterates the meaning behind the title of the album and tour, noting that an “EPIC DAY” is essentially the best possible day that can come, but it’s impossible to know if that day will ever truly come or not. Koshi interacting with the crowd during “Uchouten” from the revolving stage. Koshi says they want to continue being the band that can help make “EPIC” days, and jokingly adds that fans should, “Feel free to call upon us anytime.” He then asks what they can do from here, as they are already “in ecstasy”. Shortly thereafter, the mic session builds to the intro to one of the band’s best-known songs—a song that virtually no LIVE-GYM would be complete without. ultra soul ★★★★☆: That song, of course, is “ultra soul”. Despite premiering in only 2001, it has been performed more than any other song in the band’s catalogue outside of three: “ZERO” from 1992, “Easy Come, Easy Go!” from 1990, and “BAD COMMUNICATION” from 1988. The inspired opening suits the rest of the performance well. The song is performed with the same high-energy freneticism that has become its trademark, and while some may lament how often it has been played relative to other songs, the equally energetic response generated by the song with fans in attendance cannot be denied. Every aspect of the performance is on point—there are really no complaints to be had on that end. Swimmer yo!! 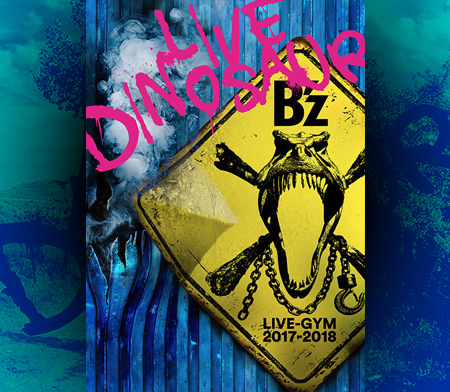 ★★★★★: After seven years off the LIVE-GYM circuit, dating back to B’z LIVE-GYM 2008 “ACTION”, the relentlessly upbeat “Swimmer yo! !” begins during the outro of “ultra soul”. The song returns with that same charisma of years past but in a slightly more rock and roll arrangement characteristic of the band’s recent two-guitar live style. In addition its magnetic sound, it’s quite a watch as well given the bouncing around on the stage, the instrument breakdowns, solos, and wild lighting effects. The song has always seemed like a fun one for the band to perform and that impression certainly is on full display here. Tak in the midst of his solo that included notable 1999 solo composition “GO FURTHER”. Tak’s Solo: Tak takes center stage next, performing a lighting fast guitar solo with no backing instrumentation before he is joined by the rest of the band on “GO FURTHER”. The song, a cornerstone of his solo compositions, had not been played in a live venue since 2009’s festival appearance at SUMMER SONIC 09. BURN -Fumetsu no Face- ★★★★☆: Tak’s solo transitions into the criminally-underplayed 2008 single “BURN -Fumetsu no Face-“. The performance begins amidst a breadth of fire and flames on the stage. The effects continue throughout a well-played and sufficiently rocking rendition of the song. On the live stage, Tak and Ohga’s dual guitar approach gives the tune an edge that creates a proper hard rock anthem out of an already great song. Prior to the next song, an organ melody begins in the background as Koshi draws the crowd into a series of call-and-responses. As he does, preparation from the crew begins as lights are dangled from the ceiling down to the ground and decorations are added around the arena. Koshi goes around to the band members individually to continue the call and response until working with Tak as a skit develops in the midst of it. The entire sequence is reminiscent of those great, late moments at B’z live shows and is already up there with the best of them. Koshi relentlessly uses his extensive vocals to challenge the crowd to follow him in seven minutes of shouts, screams, and chants, until the band erupt into the song many attending the tour had been waiting for. Moment from the performance of “Las Vegas”, one of the night’s undisputed highlights. Las Vegas ★★★★★: Album opener “Las Vegas” begins as various stage effects come to fruition and the arena fills with various motifs common to Las Vegas and American culture in general. The resulting performance is a spirited affair that justifiably could bring the song forward into future LIVE-GYMs without any room for complaint. The audience never miss a chance to chime in at the Elvis Pressley-inspired “ah-ah-ah” chant, as Tak provides some of his finest guitar work of the night. 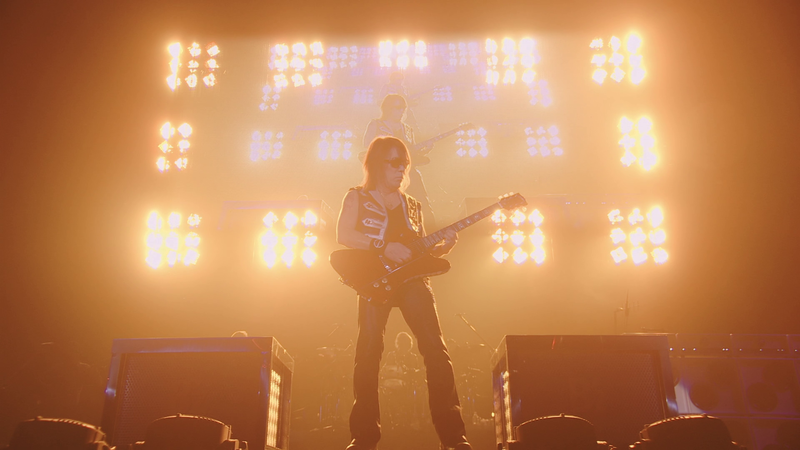 All told, “Las Vegas” is a B’z song amongst B’z songs—everything you need and expect from the band can be found right here, and in live form, it’s even better than its home on the album. EPIC DAY ★★★★☆: Following a minute-long organ intro by Masuda, the titular song to the tour’s album “EPIC DAY” closes the main portion of the show with the hardest sounds of the night. Despite the extremely fast pace at which the performance proceeds, the band continue unabated without missing a note. 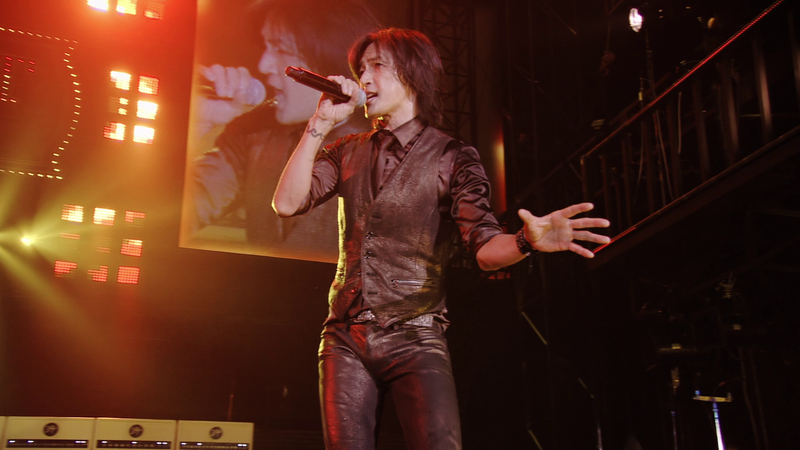 While an undoubtedly solid performance, it does not quite hit the highs of previous pre-encore delights, such as the soulful rendition of “Koubou” from 2008’s “ACTION” tour. As was the case with ENDLESS SUMMER, B’z return to the stage after a break for a two song encore of familiar hit singles. As the crowd applauds with the band now back on the stage after a brief intermission, Koshi thanks the fans for their appreciation and support. Ichibu to Zenbu ★★★★☆: A recent hit in the B’z catalogue, “Ichibu to Zenbu”, begins here with a brief and mellow electric guitar and vocal intro. Undoubtedly the most popular song of the band’s modern era, the song is greeted with a fervor not dissimilar to what could reasonably be expected of “ultra soul”. The band’s characteristic vigor is clear even here, even as the show winds down with a performance of the song as energetic as any in its admittedly brief history. B’z during the show’s encore. The night was ended on a surprising note, reviving a secret old song that hasn’t been played live in some time. Ai no Bakudan ★★★★★: The final song of the show is appropriately one of the band’s nearly unparalleled live hits: “Ai no Bakudan“. 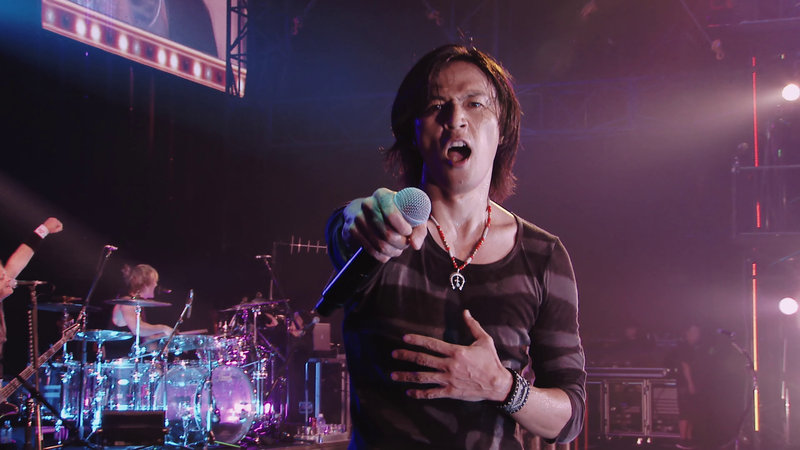 Despite coming at the end of a nearly three hour show, Koshi shows no sign of fatigue as he runs, sings, and jumps all in tandem throughout the song. During the second chorus, when he turns over the song to the audience, they happily oblige, proving the song will work at any point in a setlist and still draw the same warm reaction from the audience. The song itself ends in a surprising note, reviving a classic B’z song not played live in many years to close out the show. At the end, Koshi thanks the staff and audience members for an “EPIC NIGHT”. 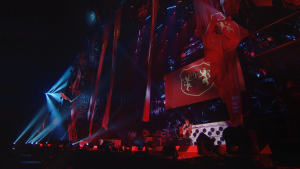 As the band members leave the stage and Tak and Koshi roam about the stage to wave at fans, “Hitori Janai Kara -Theme Of LIVE-GYM-” plays for fans to sing-along to as is custom for the band since 2010. When Tak and Koshi meet in the middle of the stage as the song concludes and embrace briefly, fans erupt in applause. Koshi takes to the mic one final time, saying, “You have all been great, thank you so much,” and ending with the usual promise that they would return. As a special bonus, the otherwise unreleased and still-untitled song that was played to the crowd after the band left the stage during the tour is played in its entirety over the credits on the home video release. If precedent suggests anything, the song should be released on a future single as a B-side in due time. Alongside the credits is extensive backstage footage and various moments from earlier shows on the tour. Tak’s guitar work is on point and at its highest level; Koshi shows that age hasn’t slowed him down in the slightest, still running and jumping all over the stage per usual. “YOU & I” is a perfect live song; you’ll be missing it in retrospect when you re-watch previous concerts. “Las Vegas” and the lead-up to it are legendary. Plenty of gems and underutilized songs included in the setlist. Wild energy of “Man Of The Match” makes for a surprisingly great live showing. “Atsuki Kodou no Hate” proves it should have always been a live staple; new arrangement is a success. “Blue Sunshine” is still a great and under-appreciated song. “Uchouten” in its LIVE-GYM incarnation is a hit. “Swimmer yo! !” is still one of the band’s most charming live songs. The inclusion of a full new song as the credits theme is a nice touch. Lack of “Classmate“, commonly seen as the strongest ballad on the album, is a shame. “Exit To The Sun” is not an especially fitting live choice. Gritty, experimental version of “ZERO” and its accompanying jam session may prove divisive. 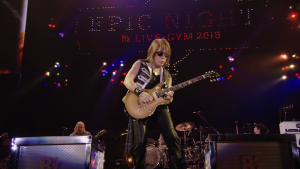 B’z LIVE-GYM 2015 -EPIC NIGHT- on DVD & Blu-ray is a sound addition to the B’z catalogue with a great many highs and few lows. The show is constructed in a way that fully explores the band’s catalogue while simultaneously covering almost all of their latest album. The songs are spaced out in a way that takes advantage of the source material in an admirable way, but the spate of ballads earlier in the setlist does make a single-sitting viewing difficult. Nonetheless, while a great show, EPIC NIGHT may not be the best choice to use an introduction to the band’s live works. The deep dive into the catalogue may not work for those unfamiliar with the band’s live output, because while some of the staples are present, a great many chances are taken with the setlist. This, naturally, will be greeted warmly by fans eager to hear some of their favorite gems played live, but may not appeal to those unfamiliar with the band’s more obscure work. Ultimately, the release is certainly one that has fan-service appeal but isn’t likely to demand the attention of newcomers. 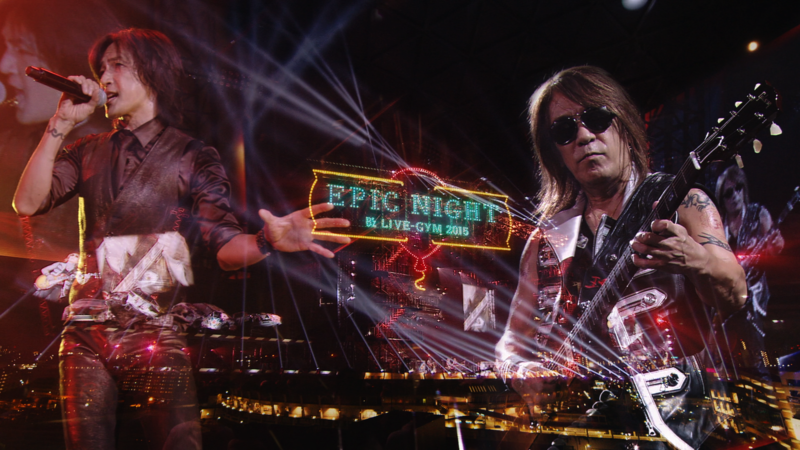 Even as B’z comes up on their thirtieth anniversary in 2018 and Koshi and Tak are now into their 50’s, the band still holds nothing back on the live stage. Tak’s guitar technique only gets better with age while Koshi’s delicate care of his voice shows as he goes for three hours at full strength without dropping a note. It must be said that B’z still knows how to put on a good show and this release is no exception: the updates to various songs exemplify the expert musicianship you’d expect from the band, the ballads are emotionally percipient and soulful, and the production values for the tour are amongst the best in the band’s history. 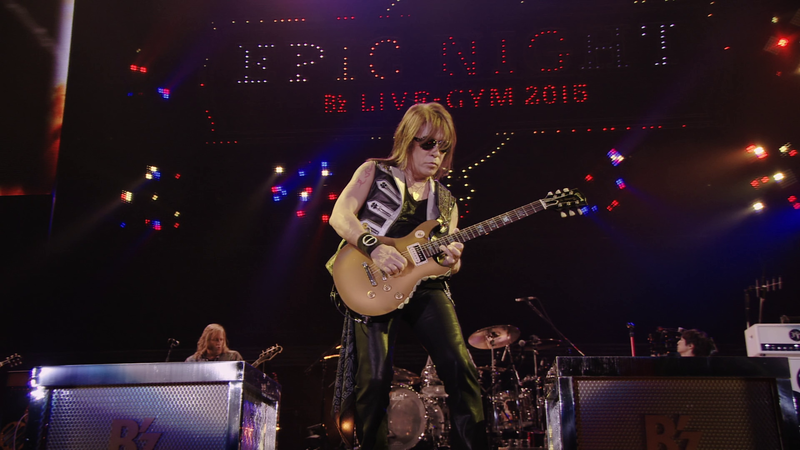 When all is said and done and the credits roll, B’z LIVE-GYM 2015 -EPIC NIGHT- really proves one thing: Whatever B’z intends to follow with in 2016, it certainly will not be something to miss.